If you were climbing the mountains in twelve hours you probably didn't need half the stuff we took, but as we had a break and my car in between the two days, we brought endless amounts of food, and overnight things for a stopover at a local B&B. We set off at 6am on the first day, which proved to be a challenge in itself, and made the drive to Ribblehead, North Yorkshire, to meet the bottom of our first Everest of the day, Whernside. 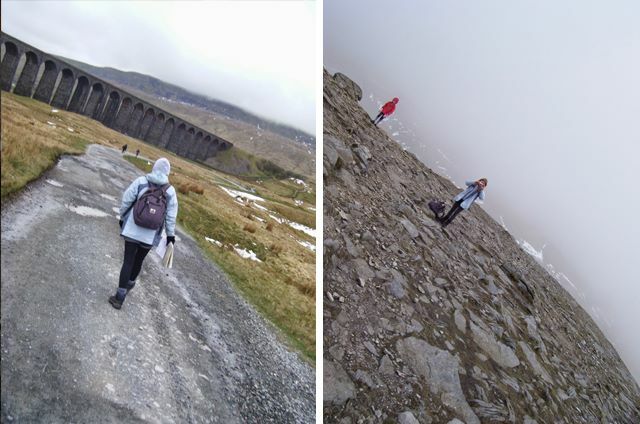 After the coffee shop we faced our next battle, Pen-y-ghent, which was supposedly the easiest of the three mountains. It was clearly smaller than our previous mountain but more difficult to climb. Snow surrounded the path (I don’t remember it snowing in months) and on the way down was a literal climb, holding on to rocks. After scrambling down Pen-y-ghent amongst the local inhabitants of sheep, we completed our first day. I’m not that unfit but my legs were killing by this point, so good luck to anyone who attempts all three mountains at once. We then drove to our overnight destination which was in Ribblehead, North Yorkshire. Ribblehead is what I expect from any Yorkshire village, it’s cute, with a few local pubs, a fish and chip shop and a market comprising of two stalls. A true reflection of an English country village. Pain and hobbling aside, we completed the three mountains, which is what we set out to do. We may not have done it in twelve hours, but I still ticked if off my Things to do before I’m 25 list and I’d travelled a part of my own country that I’d never really experienced before. A lot of people I meet through my travels generally ask “where is good to visit in England?” and I always argue that they should visit the Yorkshire Dales or the Lake District. Both fairly different places but both have their own charm and offer a varied view of Britain, and what my wonderful country has to offer the average backpacker.